The Mill is a 6809 coprocessor board for the Apple ][. From an eBay auction, here's a picture of a Rev B The Mill and some documentation. the memory map to better suit OS/9. maps. The first is one-one with the 6502, the other inverts A15. the 74LS367 with the daughterboard. Must be a timing adjustment. >Mine doesn't have a ROM either. >ROM is, you will see a large trace between pin 24 and 21. >a 2532 which both require VCC on pin 21 to operate. register). $C0m7 disables the A15 address remapping when set. DOS assembler manuals that came with my card. 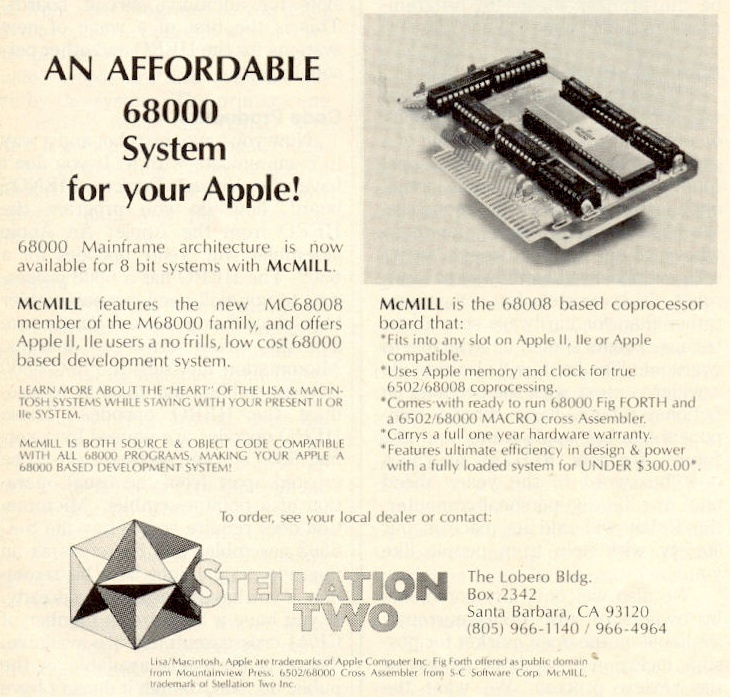 There was also a 68000 (OK, 68008) version of The Mill, called the McMill. Here's an advert for it.